Last year, I wrote a series on rechargeable batteries. I’ve long been a proponent of them, having started using them in wireless mics in 2006. In that series of posts, I did some pretty extensive testing to see exactly how long two modern, NiMh AA batteries would run a Shure UHF-R mic with an SM58 capsule on it (with music played through a wedge to simulate the mic processing audio). I compared the run time to a brand new Duracell ProCell (considered the standard for alkaline–aka disposable–batteries). I expected the NiMh batteries to hold their own against the ProCell, as I’ve had good experience with them for years. What I did not expect is for the ProCells to be completely trounced by the rechargeable cells. In that test, the best NiMh cells ran for 14 hours before the mic switched off. The ProCell only managed 9.75 hours before going dead. 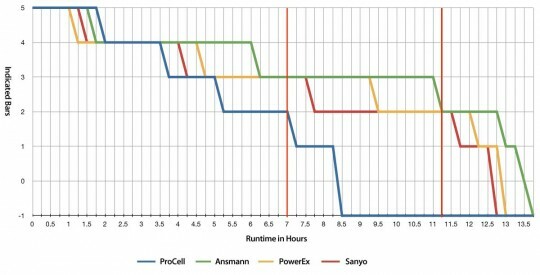 So not only do rechargeable batteries save you a bunch of money, they also run longer than a ProCell (by over 4 hours!). Faced with that clear and decisive victory, many people made the switch. However, some remained unconvinced. “Let’s see how they hold up in a year,” was a comment I heard often. So here we are, one year later. This time, I pulled three sets of NiMh batteries from our regular stock. These are batteries we’ve been using every week for a year. I have no idea how many cycles are on each one, because we have more stock than we actually need. I can tell you we don’t baby them, nor do we abuse them. They’ve always been charged at the soft charge setting (500 mah), and we always pull straight from the charger. Last time around, I tested two low self-discharge chemistries, the Ansmann Max-E and the Sanyo Eneloop. Neither provided the runtime of the higher capacity NiMh batteries, but they both outlasted the ProCell. As I don’t see any compelling reason to use low self-discharge batteries in wireless mics, I’ve pulled them from our stock and didn’t re-test. I have the charger capacity to always fill mics from the charger and suggest that to everyone. I do use Eneloops at home, however, and they’re fantastic. But let’s get on to the results, shall we? It was pointed out that I did not include model numbers for the batteries in question. So here goes: Ansmann 2850 mAh, PowerEx 2700 mAh, Sanyo 2700 mAh. All are NiMh chemistry. As you can see from the chart, the ProCells once again lost. Big time. This time, we got 8.5 hours out of a fresh set of ProCells, while the worst NiMh battery ran over 12.5 hours. Just as importantly, the “fall off the cliff” point (as indicate by the vertical red lines) is 7 hours for the ProCell and 11.25 hours for all three NiMh batteries. I define “fall off the cliff” as the point where you really should replace the battery as the life declines very rapidly after this point. Interestingly, last year, the Sanyo ran the longest at 14 hours (beating the Ansmann by 45 minutes); this year however, the tables turned and the Ansmann outlasted Sanyo by well over an hour. It’s also interesting that all three NiMh batteries fall off the cliff at roughly the same point, however the Ansmann lands a little softer, giving you a little more time to get them changed. Now, with that said, quibbling over the last hour of run time in the scope of a total run time of 14 hours is rather academic. And I don’t recommend you push them this far anyway, you’re really asking for trouble after about 8-9 hours with any of them. Again, it’s interesting to note that the Ansmann indicated 3 bars far longer than the rest of them, which is consistent to what we observe each weekend. In our use, we battery up the mics around 12:30 on Saturday, and power them off at 6:45 or so. Most of the time, the mics are reading 3 bars, though the Ansmanns tend to be reading 4 at that point. When we use them in our PSM900 IEMs, we rarely see them report less than 4 at the end of the day. Sundays are similar, though the runtime is shorter. We’ve gotten pretty confident in the run time of these batteries; to the point where we really don’t spend much time thinking about it. Sure, I have Workbench open at FOH and glance over occasionally, but it’s more to make sure they’re all turned on; I rarely consider the battery gauge. For me, that’s a big benefit of using the rechargeable batteries; I just don’t think about them anymore. When I’m at FOH, I’d much rather spend my time thinking about the mix than wondering whether my batteries are going to hold out for one more song (and I've been in that boat far too many times with ProCells). Last time around, I gave the nod to PowerEx batteries as the winner, though I acknowledged the other two as being so close that it really doesn’t matter. A year of use has changed my mind. We have a bunch of all three batteries, but we use the Ansmann more than the others most of the time. This is for a few reasons. First, the Sanyos are bigger than the others and don’t fit well in the UR2s. We have to pull them out, and that’s caused some degradation of the plastic wrap on the outside. Some of them are really coming apart. The PowerEx are also breaking down a little bit, and again are slightly bigger than the Ansmanns. They come out of the mics better than the Sanyos, but the smaller Ansmanns fit the best. Overall, the Ansmann cells are holding up very well, both in charge capacity and physically. We have had two Ansmann batteries short out internally, however. I’m not sure what caused this; the vocalist noticed the mic heating up, so we pulled the cells and found a clear dark line on the top of the cell. This happened twice in the first 6 months of operation, and hasn’t been repeated. We assume we got a few bad cells, because I’ve used at least 150 Ansmann batteries over the years and these are only two to ever go bad. As I’ve said over and over, we’re saving a ton of money every year on batteries; at least $1,000 and probably more. Given that it cost us less than $300 to get into it, it’s a pretty fair bargain. I expect the batteries to last 5 years before we have to replace them, our savings is pretty significant. It’s also considerably more environmentally friendly to not dump thousands of used AAs in the trash every year. We use them and don’t think about it, which I really like.